Not all thermometers are created equal. In fact, they can vary quite significantly in terms of accuracy. And when 0.5 of a degree can mean the difference between a trip to the ER or spending the night at home, you want to make absolutely sure. Babies in particular need a specific type of thermometer - and an axillary (armpit) one just won't do. But there are just so many options out there! And prices vary just as much. Could a thermometer that's under $10 do the trick, or do you need to invest upwards of $60 to $80? Well, we've done the research for you. Here's what you need to know about the different types of thermometers for babies and kids, as well as our top choices. Although these don't sound the most pleasant, they are the most accurate when it comes to getting your infant's temperature. You'll want to look for one that has a flexible tip and wide base. This ensures the thermometer won't be inserted too far, which can be dangerous. Rectal thermometers are a must for infants - newborn to 3 months of age, but can be used in children up to 3 years old. 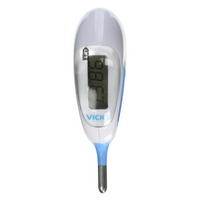 Vicks Baby Rectal Thermometer $28.62 @ Amazon.ca. This thermometer offers a quick reading in 6-10 seconds on an LED back-lit, digital display. It is easy to clean, has a flexible tip, wide base, and is only a rectal thermometer. You can get multi-use versions, but why would you want an option that can be used rectally and orally? These are the new guys in town, and typically the most expensive. BUT, they are accurate, and have been approved for use in infants under 3 months of age, lthough the experts still urge rectal thermometers for newborns. Which is why we have placed forehead thermometers in spot number 2. Temporal artery thermometers use infrared technology to measure the temperature of the temporal artery on the forehead. They can be tricky to get the hang of, so be sure to read the instructions thoroughly, but once you do, these are quick and accurate. So much so, that many hospitals use them. Temporal Artery Thermometers are best suited to children over 3 months of age. 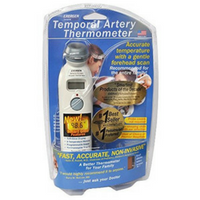 Exergen Temporal Artery Thermometer $68.17 @ Amazon.ca. This thermometer offers an accurate temperature with a gentle forehead scan. In fact, you can even use it while your child is sleeping. It can be used on all members of the family. Ear canal thermometers are minimally invasive, reasonably accurate, but can be deceptively hard to use. While they seem simple enough - they're placed in the ear and you push a button - they have to be placed in the ear at exactly the right position. This type of thermometer is recommended for children over 12 months of age, because the ear canals on children under the age of 1 may be too narrow to get a proper reading. With a little practice, and a cooperative child, this can be a convenient option. 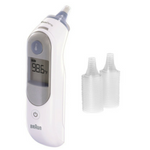 Braun Thermoscan Ear Thermometer $69.30 @ Amazon.ca. The Braun Thermoscan Ear Thermometer is our top pick for a number of reasons. It has a guidance system that offers visual and audible reassurance that it has been positioned correctly in the ear. It also includes a memory function that recalls the last temperature reading, and comes with lens filters that are BPA-free. These filters minimize the spread of germs between each use. Recommended for children aged 4 or older, these thermometers are relatively accurate and easy to use. However, most of them are multi-use thermometers - meaning they are often oral and rectal, or oral, rectal and axillary. If you are going to go this route, be sure you are consistent with how you are using it, as well as following proper instructions for each method. Patec Digital Medical Thermometer $12.99 @ Amazon.ca. While this one can be used as an oral, rectal or axillary thermometer, we recommend it be used orally because of its narrow base. This thermometer has received great ratings from parents, comes with a fever alarm and automatic shut off. This is the thermometer that many of us grew up with, but it's actually the least accurate! As a rule of thumb avoid using this method, and instead opt for an oral reading with children 4 or older, and rectal if they are 3 or under. These thermometers are built right into a soother, which would appear to be ideal. However, doctors do not recommend them, and they are not considered accurate. Instead, opt for one of the above options. What do you think? Do you have a tried and true method for taking your little one's temperature? Any thermometers you would add to our list? Let us know in the comments below or on our Facebook page!